What to wear over 50? Five years into writing Flattering50, I've discovered what to wear isn't my biggest fashion challenge. I look best in clothing that flatters my body shape, suits my lifestyle and is well-made. The real challenge is where to find flattering fashions. Designer Ronen Chen seems to understand this challenge and has created a collection of fitted and relaxed fashions that flatters a range of body shapes and lifestyles. 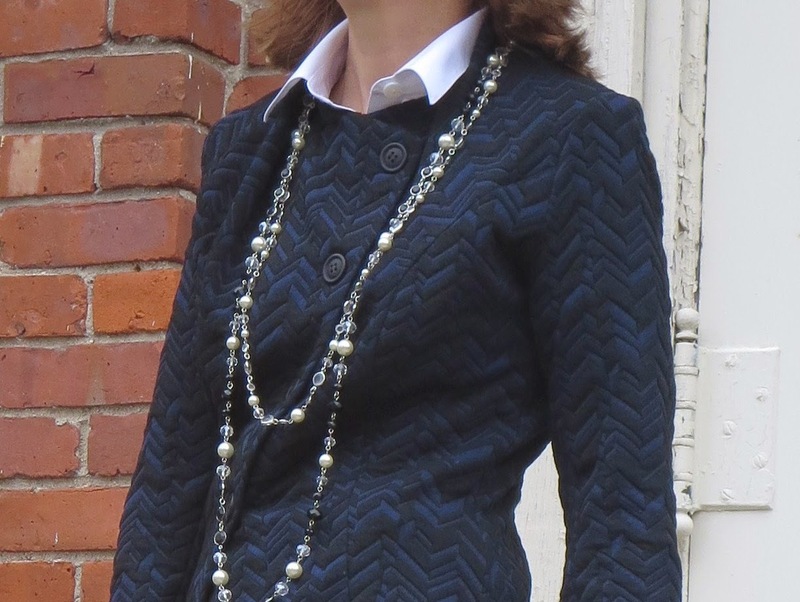 Recently, the designer sent me his fitted Miriam Textured Jacket (above) to share with Flattering50 readers. If you're are just learning about Ronen Chen, now is a great time to visit his site, with up to 40% off on the entire collection. As a petite woman over 50, I know that fitted jackets, sweaters and tops suit me best. Also, since the aging process can be a little harsh on many levels, I look for clothing that is soft and feminine. In other words, my days of wearing shapeless man-tailored suit jackets are over. The Miriam Textured Jacket (was $265, now $179) is a beautifully fitted piece with feminine detailing, like the draped standing collar and row of buttons set just off center. Made of midnight blue jacquard fabric, the knit jacket is super comfortable, which makes it a perfect piece for a long day at the office and then, dinner out. Not long ago, I wrote about the Statement Jacket, which is a great way to energize your style over 50. A well-made statement jacket, like the Miriam Textured Jacket, with its texture and detailing, is also easy to style. All you need is a simple skirt or pair of slacks and a pair of heels. For the photos above, I chose a lightweight black skirt. (I love pairing black and blue!) Since I was wearing the jacket to a holiday lunch, I added a couple of long strands of pearls and glass bead--for a little festive twinkle. These days, I'm mad about textured pieces and will, on occasion, mix textures. Below, I've styled the jacket with a black and white skirt. The belt adds a little extra structure. Even this petite woman doesn't live by fitted pieces alone. On the weekends, I like to relax in super soft fabrics with a more relaxed fit. The trouble is, it's not always easy to find relaxed fashions that have style. The Ronen Chen collection offers a wide variety of draped and relaxed fit garments--tops and bottoms--in prints and sophisticated monochromes. Many of the tops and tunics offer asymmetric styling as well as three-quarter or long sleeves. These well-made garments in jersey blends and soft knits feel and look wonderful. Just style with your favorite jeans and you're ready for anything--shopping, a movie or a casual dinner out with friends. I wear my Ronen Chen draped cardigan constantly!